Can't even shout, can't even cry. You're gonna die screaming but you won't be heard. Tell me that's not frickin' freaky. The Gentlemen are fairy-tale monsters in search of seven hearts. They come to town and steal all the voices so no one can scream. In the tales, no sword can kill them. But the princess screamed once and they all died. Written and directed by Joss Whedon, the Emmy-nominated "Hush" is one of the best examples of what makes BtVS so special. With more than half of the episode completely silent, the young cast had the chance to show off their acting ability. The monsters were really creepy, the storytelling innovative, and there was still enough humor to make the show watchable again and again. Plus, it was a big poke in the eye to everyone who said the show's only strength was the snappy dialogue, so that was nice, too. With Series IV of their Buffy line, MAC decided to make up for the dearth of villains by having a whole slew of baddies, including two Gentlemen. 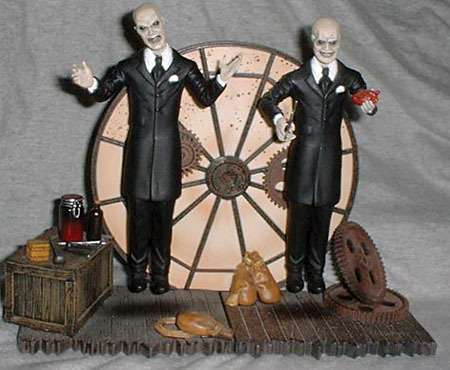 Clad in their mortician-worthy suits, both of the figures have the same basic body - articulated at the neck, shoulders, biceps, elbows, and wrists - there are a few differences, most notably the heads; the "lead" Gentleman (who, incidentally, was played by Doug Jones) has his head tilted slightly to his right, while the other is straight. Interchangeable hands can also give you a wider range of appearance. 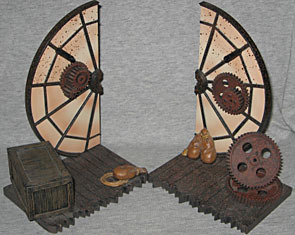 Each figure comes with half of an ornate clocktower base; put them both together, and you can recreate the horrors' secret hideout. Large gears are strewn about, sandbags lie slumped on the floor, and there's a box on which to arrange the myriad accessories these two sets include. A peg protruding from the rear of the base snaps into the Gentlemen's backs, allowing you to simulate the way they floated silently around town. Each base is about 4¼" wide, 3" deep and 6" tall. The "hover peg" is 1" long, and lifts the figure ⅜" off the ground. The bases aren't the only things that are different: both Gents come with unique accessories! Gentleman 1 (with the tilted head) includes tongs, a scalpel, an awl, a jar seemingly filled with a viscous red substance, and even the box which held the town's voices; Gentleman 2 has two sets of forceps, a human heart and a large jar with a clasp top. The "arms" on the larger set of forceps break easily, which is unfortunate, because they're a bit too thin to be fixable. Still, it's all good stuff. Each of the Gentlemen also comes with one of the bandaged, straitjacketed hounds that helped track down the unwilling organ donors. Sculpted in a crouching pose, and nearly 3" tall, the hound has no normal articulation - just bendy arms. 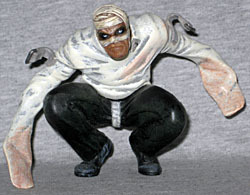 His skin looks cracked and burnt, and his eerie eyes glare up at the other figures. The figure's legs are ABS plastic, while everything above the waist is flexible PVC. The Gentlemen themselves look just as horrible as they did on the show - black eyes with white irises, gray skin, and a disturbing smile that reveals a mouth full of wicked silver teeth. They stand 6". The Gentlemen were eventually defeated, though the effects of their visit were far-reaching. 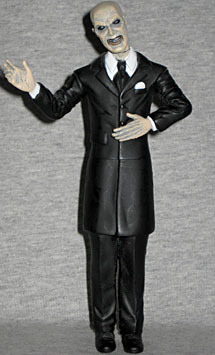 Now, with MAC's Gentlemen action figures, you can have your own silent fun.